Safety Toe Showing? Kg's Boot Guard Can Fix That. Have you tried the Mega Comfort Insole? It's a Customer Favorite! According to Foot.com, when it comes to foot health "neglect and a lack of awareness of proper care - including ill fitting shoes" are the leading reasons for foot problems. Foot.com states that only a small percent of the population is actually born with foot problems. 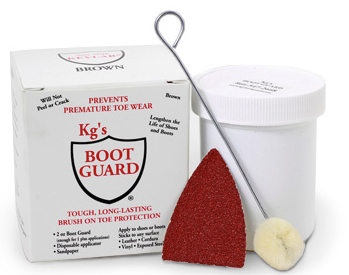 If you've worn the toe of your safety shoes and aren't ready to buy a new pair - Kg's Boot Guard can be an easy solution to get more miles out of your shoes. It is designed to cover the exposed safety toe and create a strong and durable surface. The product can be also applied to new safety shoes as a precaution. Each box comes with a 4.5oz container of boot guard (brown or black) and a disposable applicator. We have found that each container lasts at least three applications. 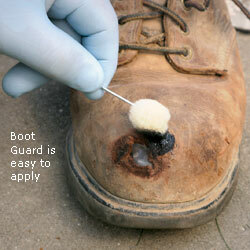 Kg's Boot Guard is a consistency similar to paint - so application is easy! The first step is to prep the area that you will be applying the product to. Prep involves cleaning and sanding the surface. Then you apply the first coat, and allow it to dry for 3-4 hours. A second coat is recommended - which we suggest you allow to set overnight. Applications can also be layered later for increased protection. If you are picky about the way your boots will look, we suggest using a piece of masking tape to create a straight line before applying the product. Work in a well ventilated area and wear rubber gloves when applying the product. Kg's Boot Guard is available online, in stores and on select industrial footwear trucks. Do your feet, legs, or back hurt? Are you looking to increase the cushion and arch support in your current footwear? Introducing the Personal Anti-Fatigue Mat insole from Mega Comfort! This customer-favorite features maximum shock absorption and dual layered memory foam technology. It provides maximum comfort to keep you feeling great even after a long shift. The insole is machine washable, anti-fungal, anti-bacterial, anti-perspiration and has odor reducing scent. What's not to love?!? The Personal Anti-Fatigue Mat insole is available at all Vanderloop Shoes stores, on our safety footwear trucks and vanderloopshoes.com. Ask your industrial footwear rep about making this insole part of your safety footwear program! "There are two different categories of heel pain. The first is caused by over-use repetitive stress which refers to a soreness resulting from too much impact on a specific area of the foot. This condition, often referred to as “heel pain syndrome,” can be caused by shoes with heels that are too low, a thinned out fat pad in the heel area, or from a sudden increase in activity. Plantar fasciitis, a very common diagnosis of heel pain, is usually caused from a biomechancial problem, such as over-pronation (flat feet). The plantar fascia is a broad band of fibrous tissue that runs along the bottom surface of the foot, from the heel through the midfoot and into the forefoot. Over-pronation can cause the plantar fascia to be excessively stretched and inflamed, resulting in pain in the heel and arch areas of the foot. Often the pain will be most intense first thing in the morning or after a prolonged period of rest. The pain can gradually subside as the day progresses. To properly treat heel pain, you must absorb shock, provide cushioning and elevate the heel to transfer pressure. This can be accomplished with a heel cup, visco heel cradle, or an orthotic designed with materials that will absorb shock and shear forces. When the condition is pronation related (usually plantar fasciitis), an orthotic with medial posting and good arch support will control the pronation and prevent the inflammation of the plantar fascia. Footwear selection is also an important criteria when treating heel pain. Shoes with a firm heel counter, good arch support, and appropriate heel height are the ideal choice. In addition, breaking the pain cycle with the use of oral anti inflammatory medications, cortisone injections, stretching and icing are all treatments as well. If the problem persists, consult your foot doctor." 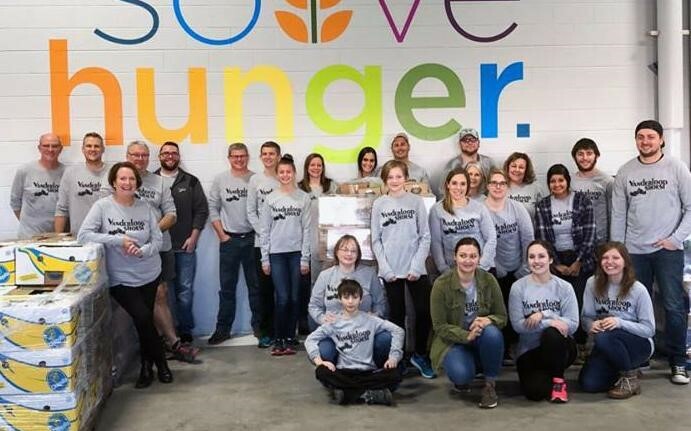 On November 10, Vanderloop Shoes Inc employees and families volunteered to scoop and bag food at Feeding America Eastern Wisconsin. In less than 3 hours we scooped and sorted 7,000 lbs of donated pasta - which equals 5,833 meals! 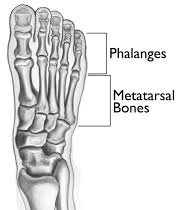 Metatarsal guard footwear (commonly known as met guards) are worn to protect the metatarsal area of your footwear (see image). Met guard boots feature a safety toe and a met guard to enhance the foot protection of the wearer. Met guards are designed with an extra piece of metal or fiberglass that lays over the top of your foot. This serves as a safe guard to protect more of the footwear versus a regular safety toe. Met guards come in several different styles including internal (built into the shoe) or external. Neither style is necessarily safer - it is up to customer preference which feels better or is best for their work environment. Vanderloop Shoes carries met guard footwear from brands like Carolina, Timberland, Georgia Boot, Keen, Iron Age, Reebok, Dr Martens, Michelin and more.